Online Casinos are an exciting place for gamblers to spend their hard-earned cash while in a secure and fully licensed online environment. These entertaining gambling portals are otherwise known as internet casinos or virtual casinos and all you need to access one of these portals is a reliable computer (Windows or Mac operating systems) and a stable internet connection. To play in the real cash mode, you will need to register an account with the casino and you must 18 years old or above before you can place a real cash wager. Some online casinos are downloadable and others are non-downloadable, but the majority today tend to give players both options. Adding funds into your casino account or withdrawing your winnings is a relatively straightforward task and players today can use a number of different secure online casino banking methods such as credit & debit cards, e-wallets and bank transfers. Various prepaid cards can also now be used to top up your account. Online Casinos are the ideal place for you to have a flutter on your favourite casino games, without players ever having to leave the house. All of the online casinos that we have reviewed on this site are owned by responsible operators and they are fully licensed to offer real cash gambling services. They also happen to be powered by some of the worlds most advanced online casino software providers such as Playtech, Microgaming, Realtime Gaming (RTG), Net Entertainment (NetEnt) and Sheriff Gaming. 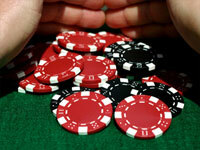 This site basically contains everything you need to know about online casinos, and more! Truth be told, you may not even have noticed or heard anything about a rather unexpected turn of events with respect to legal online casino action and legal online gambling sites. Get this: the industry shattering news comes from the state of Illinois. Yes, it is certainly true that the state of Illinois has been making headline news as of late with the out of control state budget, political corruption, record homicides in the city of Chicago and such. Yet despite all of that, there is some good news coming out of the Illinois Senate. It is reported that the Illinois Senate passed a Bill that would essentially go all the way. That is, if the Bill makes its way all the way through the legislative process, then both online gambling sites and online daily fantasy sports will become legal and regulated. Interestingly, up until news of the passage of HB 479 was released, any sort of action on legalizing online casino in Illinois was viewed by most gambling industry pundits as a long shot. Thus the surprise when word came that the Illinois Senate easily passed the Bill. For the record, the Senate vote tally for HB 479 came out as 42 in favor, 10 opposed. In other words, a clear sign that attitudes towards legal online casino have definitely shifted. You don’t have to look very far to notice that the world of gambling, both online as well as brick and mortar based is in the midst of some rather interesting changes. And understand that these changes involve much more than a switch to online gambling sites versus the traditional land based casinos. Note that in large part these up and coming changes are being put in place in order to appeal to a larger casino player base. You see, the traditional casino games offered are in fact no so appealing to the younger generations. That means that casino operators of all sizes and shapes are working feverishly behind the scenes to transform their gambling sites in such a way that they offer something that clearly appeals to this much desired younger client base. Note that this issue and many others were hotly debated at a recent gambling conference held in Atlantic City, New Jersey. Pay attention to the fact that there were some fairly big names at the conference. In addition, the conference included a wide range of participants ranging from casino executives to digital media experts and even payment processing firms. Interestingly, one clear insight from this conference is that the vast majority of the participants agreed that gambling sites must offer new experiences to directly involve the much coveted younger crowd. And that is where it really gets interesting. There is something of a test case if you will about to take place in the state of New Jersey. Recall that of all the states in the U.S., it is the state of New Jersey that has been at the forefront of advancing legal online gambling sites and online casinos. What is new is that one of the existing casinos in New Jersey is looking to take this one step further. In this case, the gambling site is none other than that of Atlantic City Resorts Casino. The rather bold move by Atlantic City Resorts is a new partnership with B2B Daily Fantasy Sports (DFS) supplier Sports AD. Here is what this is all about. There is a new gambling site on the edge of being launched. Naturally, as part of the New Jersey legal gambling framework, this new gambling site will only be available to New Jersey residents. For the record, the name picked for this new site is FastPick. Even more interesting is the fact the FastPick is clearly looking to move into daily fantasy sports betting. Yet as you probably know, the fact of the matter is that the issue of daily fantasy sports betting is still winding its way through the court system. Perhaps you will not be surprised to learn that there are a number of “big name” online casino operators that are eager to tap into the New Jersey online gambling market. This makes sense when you remember that the state of New Jersey has proved to be an astounding online gambling success story. In fact, year after year since the initial launch of legal online casino action back in 2013, the numbers have been steadily increasing. In other words, the New Jersey Department of Revenue is benefiting as are the New Jersey online casino players themselves. Naturally, this sort of success story triggers interest from additional gambling site operators that want to tap into this market. Consider the sort of revenue numbers that are at the heart of this interest. In the 2015 fiscal year, the average New Jersey average monthly online gambling revenue was around $10 Million per month. Get this, that monthly revenue is on track to rising to $20 Million per month. Now that you see the size of the gambling site revenue up for grabs you can understand the interest from other gambling site operators. And do understand that the interest from these outside gambling site operators is increasing. Whereas in the years of 2015 and 2016 there were but two new entrants in the New Jersey online gambling market, already in 2017 there has been interest expressed by no less than three online casinos. New Approach To Legal Online Gambling In The U.S.? As you probably know, the topic of legal online casino action is currently being hotly debated in the Pennsylvania legislature. For the record, this back and forth on both sides of the aisle are all about HB 271 that would legalize online gambling sites in Pennsylvania. That is the background. Now for the really interesting part of this debate. None other than Pennsylvania Senator Mario Scavello let on that in his opinion HB 271 could in fact allow for entities other than existing Pennsylvania brick and mortar casinos to apply for the online gambling licenses. Now do understand, the language allowing for non Pennsylvania entities to apply for online gambling licenses states states this is a possibility if and only if the Pennsylvania casinos do not apply for the online gambling licenses. Naturally, that triggers the question of why would existing brick and mortar gambling sites in Pennsylvania not apply for such an online gambling license? One area of contention that is causing some hesitation on the part of the land based casinos is the proposed tax rate for online slots. Note that HB 271 is worded such that online slots would be taxed at a rate of 54%. You should understand that is in fact the very same tax rate that brick and mortar casinos already pay for slot machine games. Comparatively to other online casino guides out there we're relatively small and provide players with somewhat focused information on what we think will better assist players in getting started at online casinos. Below is a listing of other online gambling related portals that offer a lot of information that are worthy of visiting. CasinoCity.com - Online - Casino City is a well presented online casino and gambling guide with a section of their site dedicated to only online gambling. This link will take you to this section of their site. Wikipedia.org/wiki/Online_casino - This page is a good educational page for players just getting started with online casinos looking for details about what online casinos are and how they work. Copyright © 2019 - BlackBartCasino.com - All Rights Reserved.